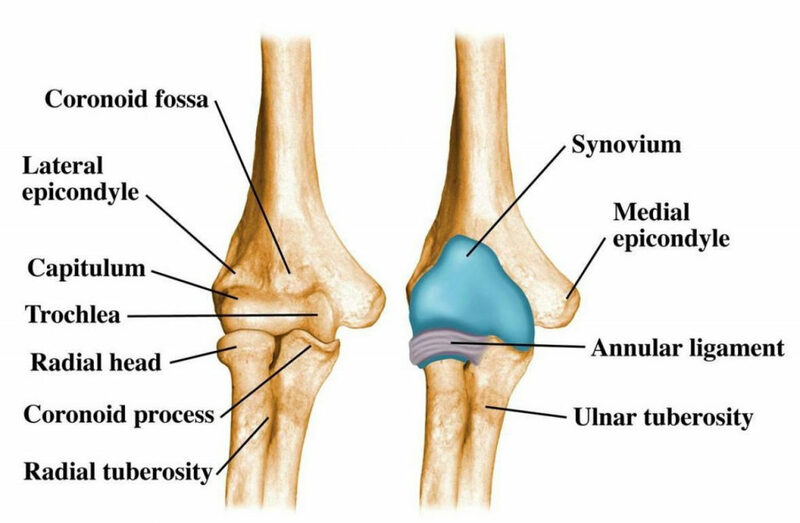 The elbow is a synovial variety of hinge joint, formed within the distal end of the humerus and the proximal ends of the ulna and radius in the forearm. The elbow permits for the flexion and extension of the forearm, as well as rotation of the forearm and wrist. The articular surfaces of the bones are separated from each other by a layer of hyaline cartilage. Smooth movement of these joints is provided by the viscous synovial fluid, which acts as a lubricant. The elbow joint has a capsule enclosing the joint. 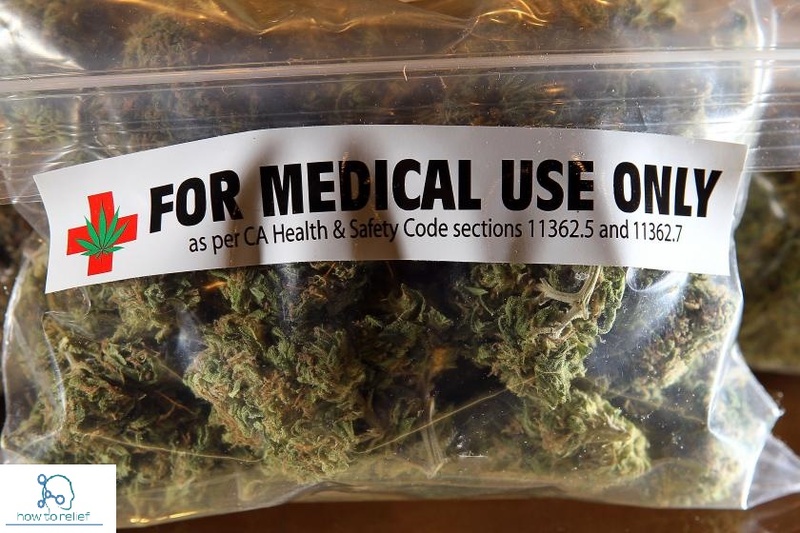 This joint capsule strengthening the elbow joint. The joint capsule is thickened medially and laterally to form collateral ligaments, which stabilize extending the and flexing motion of the elbow joint. Intratendinous – positioned within the tendon of the triceps brachii. Subtendinous – within the olecranon and the tendon of the triceps brachii muscle, diminishing friction between the two structures during extension and flexion of the arm. Subcutaneous – within the olecranon and the overlying connective tissue. 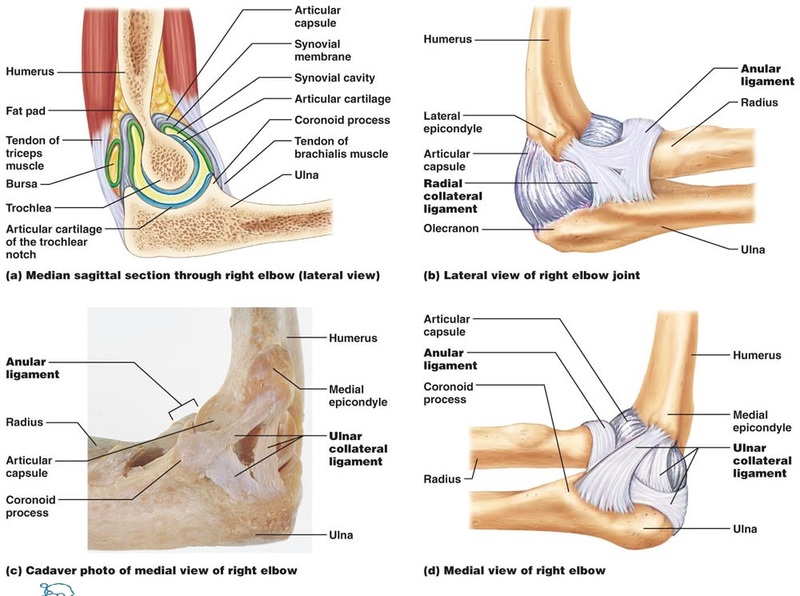 The joint capsule of the elbow is strengthened by ligaments medially and laterally. The ulnar collateral ligament originates from the medial epicondyle and attaches to the coronoid process and olecranon of the ulna. The radial collateral ligament is located on the lateral side of the joint, extending from the lateral epicondyle, and blending with the annular ligament of the radius. The blood supply to the elbow joint is through the cubital anastomosis, which involves recurrent and collateral branches from the brachial and deep brachial arteries. Nerve supply is rendered by the musculocutaneous, median, and radial nerves anteriorly, and the ulnar nerve posteriorly.